Why not share the happiness of your special day by giving a smile to children in hospital? 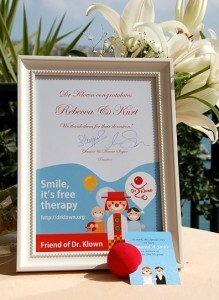 Dr. Klown offers an attractive alternative to traditional wedding souvenirs under the form of donation cards. Email us on [email protected] or call 9940 5965 to learn more about this offer.